A friend, the biographer Geoffrey Elborn, once told me how in 1977 John Betjeman awarded him two signed firsts of his books for rescuing a dog from a burning house next door to his own in Radnor Walk. He was visiting the Poet Laureate for the first time when the smell of smoke alerted everyone to a blaze in an upper storey. The emergency services were called, but the police who arrived first refused to enter the house, whereupon Elborn valiantly groped his way through the billows of poisonous smoke to rescue a terrier from a certain grilling. After returning to his host and downing several medicinal whiskies offered by the poet’s mistress, Elborn was delighted to receive signed firsts of An Oxford University Chest (1938) and Collected Poems (1948), from Betjeman himself. These were suitably inscribed with characteristically jocular references to Elborn as ‘ Chief Fire Officer ‘ and were decorated with helmets, hoses, and other symbols of the profession. Unfortunately, poverty necessitated the sale of these mementoes of a sensational first meeting with the poet, a decision Elborn still regrets. So somewhere out there is a puzzled Betjeman fan who may possibly wonder at the inscriptions in their book or books. He or she will get no enlightenment from the Letters edited by Betjeman’s daughter, nor Bevis Hillier’s exhaustive Life, though Elborn himself has written of the incident elsewhere. All this brings me to the rarity of certain titles, inscribed or otherwise, by Britain’s best loved poet. There is no question that ( Auden and Eliot excepted ) Betjeman is the English poet who attracts the most interest from collectors, something that unscrupulous dealers cynically exploit. Top of any collector’s list must be Betjeman’s debut slim volume Mount Zion (1931), which was printed in a trade edition for 5s 6d a copy and a deluxe limited edition of 100 for 12s 6d, by the publisher and connoisseur Edward James. The Rare Book Price Guide suggests a sensible range of £500 - £750 for the trade edition, but three of the four copies on ABE are listed at over £1,500, with a signed presentation, but ‘ neatly rebacked ‘ copy from Gekoski selling at a gamey £2,250. Some of the high prices demanded for Betjeman’s second collection, Continual Dew (1937), a much more common title, are even more vertiginous. You can buy a respectable copy from several dealers online for a very reasonable £30 or so , but one carriage trade dealer insists on charging $1,006 for a signed copy in no better condition that most of the others. 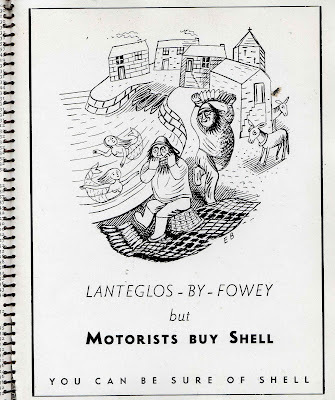 Betjeman’s first prose book, Cornwall Illustrated (1934),the first title in the Shell Guide series, and an admittedly coveted book, is similarly overpriced. Deighton’s of Bournemouth is the principal offender ( see my blog on ‘Collecting Shell Guides’ ), with their copy a whopping NINE times the price of a similar one offered by Toby English, while two other spiral bound copies come in at $270 and $339 each. Pursuing this logic, the exceedingly rare three or four titles by Betjeman, all of which were issued in tiny editions, such as Sir John Piers (1938 ), Ireland’s Own (1958) and Some Immortal Hours (1957 )would be, if available, stratospherically expensive, but of course these hardly ever come up for sale, so we’ll never know. 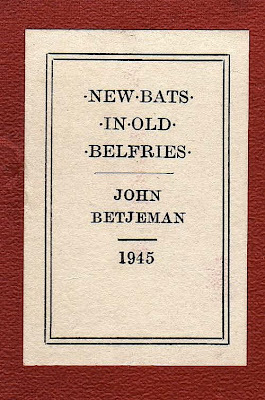 Apart from such peripheral rarities, most of the other Betjeman titles were printed in largish editions and are consequently relatively inexpensive, though the intriguing A Handbook on Paint (1939) seems impossible to find, and the Shropshire Shell Guide (written with John Piper) can fetch more than £50. Of the prose titles the best by far remains First and Last Loves (1952), which should be acquired, if at all possible, with its striking wrapper, which is usually missing. Note also the two buggered up book titles on its ‘ By the same author ‘ page. Thanks Robin. Wise and pertinent words on this Spring Sunday. Every few years Betjeman is revived and prices go up. One wonders what Betjeman will mean to our ap-happy younger generation in, say, 2025. Will they care about a Death in Leamington Spa or Miss Joan Hunter Dunn and her '...strongly adorable tennis-girl's hand...' ? One hopes so, but I wouldn't bet on it. 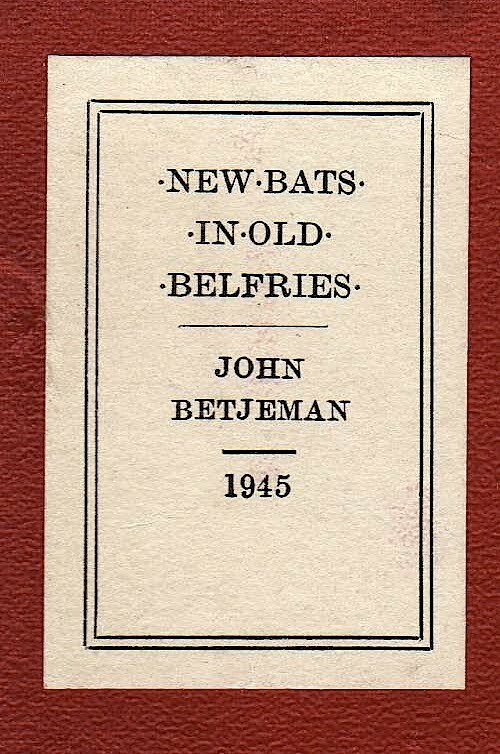 The highest auction record ever for Betjeman was $6000 in 1996 for the Onassis copy ( Jacqueline Bouvier Kennedy) of Summoned by Bells inscribed "Christmas 1960. For Jackie, with love on a memorable Xmas. John". This is closely followed by the great rarity Sir John Piers (Mullingar: Westmeath Examiner,140 copies) and ridiculously rare whimsiana such as Some Immortal Hours: A Rhapsody of the Celtic Twilight Wrought in Word and Water Color by Deirdre O'Betjeman (12 copies 1962). Just now I need these - ship and bill. Yes, many thanks Robin - very useful. I have nothing signed by Betjeman alas, whom I do like though perhaps not love as I love Osbert Lancaster (for his non-verse as well as his verse). I type this beneath a large print of the 1949 depiction of Draynfleete, signed in pencil by Lancaster in the corner (bought this in Voltaire & Rousseau in the 70s for a tenner). There is a mum holding a toddler by the hand whom I like to think could have been me (if OL had hung about the Gallowgate then). I am sure Betjeman will hold his price! 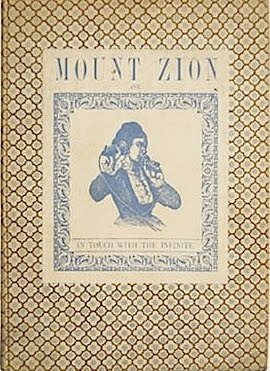 I love finding vintage books, thanks for posting! 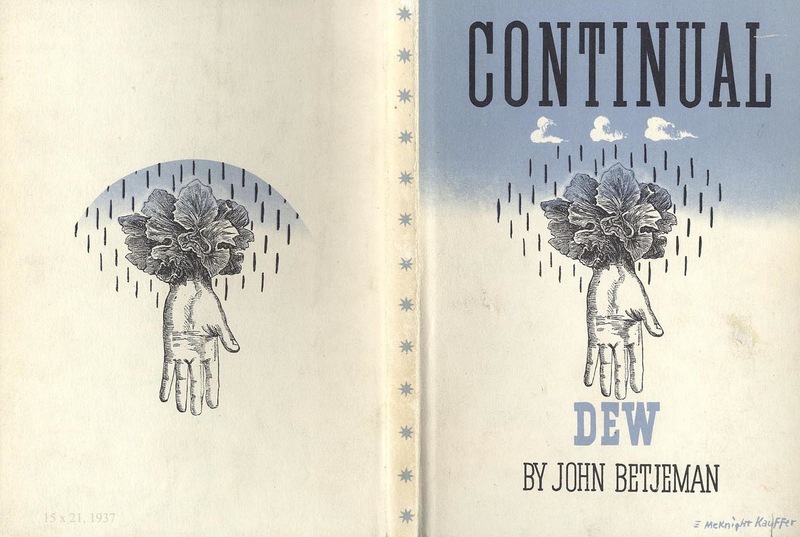 I have Betjeman's copy of The Whitsun Weddings. Will never sell it. Has all the documentation and the sale catalog in perfect condition as was received from the auction house. The book is now worth - in my not so humble opinion - the princely sum of £1250 retail.